Intensive interaction is a communication technique used with people with autism and/or severe-profound intellectual disability. 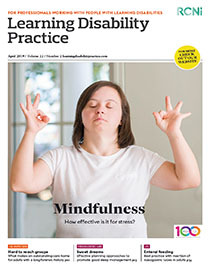 Practitioners should ensure that the complex health needs of people with severe-profound intellectual disability are met, and that their rights are upheld, by actively listening and responding to unconventional communication. This article reports a review of the literature on using intensive interaction with people with severe-profound intellectual disability. Results show that the technique can help increase people’s levels of social engagement and sociability, enhance their sense of well-being, and reduce distress. Although some practitioners can find the technique rewarding, for others it can stimulate feelings of discomfort, therefore the article also considers some barriers to implementation.